Welcome back to You Should Be Watching, my weekly recommendation of movie and TV offerings that don’t get the attention they deserve. This week for our last Halloween pick of the year, we’ll be time traveling with John Hurt in Roger Corman’s Frankenstein Unbound. Adapted from the novel of the same name by Brian Aldiss, the film puts a spin on the classic horror sci-fi tale and re-introduces questions regarding the limits of scientific exploration and man playing God. Things from the book, like the man’s name and profession, are changed here, but I think making him a scientist instead of a politician works better; he’s as much like Frankenstein as he can be. In Frankenstein Unbound, a 21st-century scientist named Buchanan is doing research and experiments with time, and it leads to time slides and disappearances. He, as well as his talking car, is transported back to the late 19th century where he encounters Frankenstein, his creature, and Mary Godwin herself. Elements of the original story play out more or less as expected with characters like Elizabeth and Justine, but things soon take a turn and the monster spirals out of either scientist’s control. John Hurt is always great, but I find his performance here particularly interesting. Buchanan is a scientist, and at first, his interest lies in the pursuit of scientific knowledge at any cost. He’s the character the audience follows and, as such, he’s the most dynamic and shows the widest array of emotions. His frustration at seeing Frankenstein going through the process of creating the creature, knowing exactly what the outcome will be, is palpable. His eventual realization that he’s following in Frankenstein’s footsteps but on a larger scale is a monumental character moment and expertly shown in his facial expression. 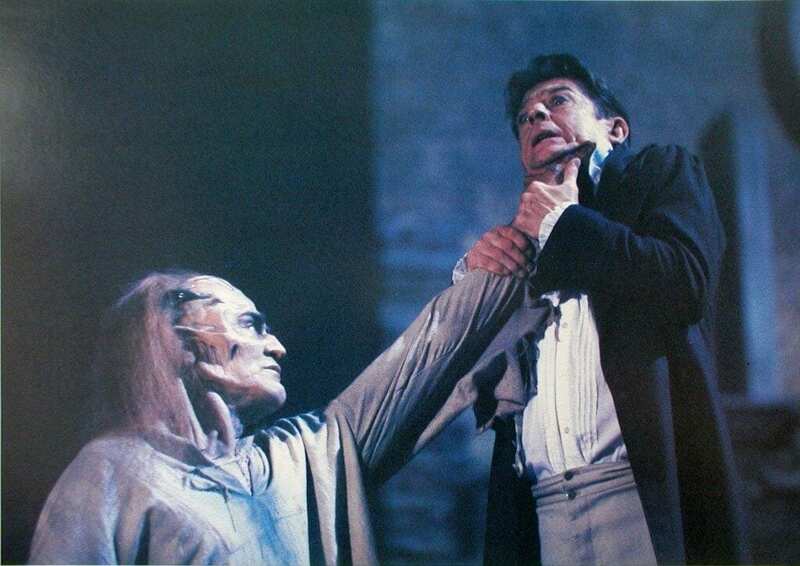 Raul Julia portrays Frankenstein, and he’s great too. He has less room for creativity, as his character is an iconic and well established one, but giving him a foil in the form of Buchanan was a good idea. He brilliantly displays the way Frankenstein rationalizes things to himself and makes excuses for his actions, such as allowing Justine to be executed rather than admit the truth. Bridget Fonda plays Mary Godwin (not yet Shelley), and while I’m not sure how close she is to the historical figure, her performance is interesting and nuanced. She doesn’t get a lot of screen time, but her brief discussions with Buchanan are telling, and they use the time very effectively. I particularly like her delivery of the line “Percy and Byron preach free love; I practice it.” Nick Brimble brings a surprisingly refreshing take on the creature; this version of Frankenstein’s monster is the first I recall not feeling sorry for. Usually, you can understand the peoples’ fear of the monster, but at the end of the day, he’s a gentle creature that was never given a chance. This guy is evil, and he relishes every minute of it. Jason Patric and Michael Hutchence portray Lord Byron and Percy Shelley respectively, and they get very little screen time, but they look cool. The visual effects in Frankenstein Unbound have a rough look to them, but I think it’s charming in its own way. I love eye-melting special effects and convincing makeup as much as the next person, but I think there’s something to be said for a smaller budget and a production that focuses more on the characters, story and ideas than eye candy. The original score by Carl Davis won’t blow your mind, but it is pretty and atmospheric at times, and at others scary and shrill. It accompanies the film’s visuals effectively, and that’s its main job. The film’s production overall has a feel that I’d describe as unpolished, and I think, ultimately, this works really well. Because this aspect is consistent throughout the cinematography, music, and visual effects, it becomes almost part of the narrative and creates feelings of tension and discomfort, perfect for a movie like this. The one exception is that the costumes are actually pretty good, but they’re not on the level of big-budget costume dramas or anything. If any genre can pull off this kind of jagged aesthetic, I think it’s horror, particularly of the monster variety. Frankenstein Unbound clocks in at a slight 85 minutes, but that doesn’t stop the film from asking big questions and offering uncomfortable answers. I don’t want to spoil much here, but Frankenstein Unbound gives the viewer plenty to think about and still manages to fit in terror, action and a bit of romance. The movie has a lot to offer, and I can’t help wondering if it’s not well remembered because of the aforementioned visual and makeup effects. I haven’t seen Corman’s other films, so I can’t compare Frankenstein Unbound to them, but I can say that it has many of the ingredients for an entertaining movie. That being said, if there is one thing I’d change about Frankenstein Unbound, it’s the length. A good half hour to forty-five minutes more could have gone a long way toward developing secondary characters more and setting up a more satisfying climax. All of the events from Elizabeth’s death onward feel a little rushed, and I’d have liked more with Mary and Frankenstein too. The vast majority of movies have flaws, and I have to say that leaving the audience wanting more isn’t an unforgivable sin. But I do think that overall, the film would be more satisfying, and maybe even better remembered if there was more of it. Frankenstein Unbound isn’t a flawless example of filmmaking, but it is very entertaining and a perfect watch for Halloween this Wednesday. Frankenstein Unbound is an unorthodox approach to the Frankenstein story, and as such is surprisingly refreshing. The music and visuals create a unique kind of lower budget monster flick, equally unsettling, but in a different way. A fantastic cast of character actors, rough but effective aesthetics, and an interesting narrative are why you should be watching Frankenstein Unbound. I saw Frankenstein Unbound for the first time on demand, but you can get it pretty cheap on Amazon. Where Did All The Original Movies Go? !